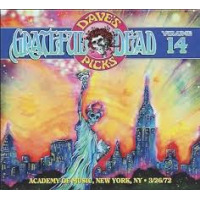 There was nothing like a Grateful Dead concert and never more so than in New York, but this one comprising Dave's Picks Volume 14, is an especially significant one: the final night (except for a benefit for the Hell's Angels the very next evening) of a six-night run at the Academy of Music on 3/26/72, taking place just before the band departed on their now legendary initial exodus to Europe. Leave it to the good ol' Grateful Dead to turn irony on its head and make the Big Apple, for all intents and purposes, an off-Broadway stop prior to their debut on the big(ger) stage; it's as if they band knew they were ready for the next step and wanted to proudly demonstrate as much for their East Coast home away from their (West Coast) home. And there's no sign of nerves whatsoever across the complete show here spread over three CD's. Quite the contrary in fact, as the Dead sound equally relaxed and focused as early in the performance as "Black-Throated Wind." Not to belie the precision in the three previous numbers, but there's a definite sense of the group listening to each other to make sure their paying customers were hearing the best they had to offer in terms of performance and material. Cover graphics for this archival series are usually eye-catching, but rarely so apropos as these fiery northern lights-like images. This latest entry in the ongoing archive series features is an unusual selection of tunes, at least insofar as this concert's position in the iconic band's timeline. The now-famous songs that debuted in England and elsewhere the next month are conspicuously absent here ("Jack Straw" is an exception,) in place of which appear no less notable numbers such as "Truckin,'" "Wharf Rat" and "Sugar Magnolia." plus a clutch of showpieces for keyboardist/vocalist Ron "Pigpen" McKernan. 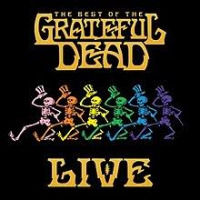 In ascending level of intense connection with the audience, these take the form of "Mr. Charlie," Big Boss Man," "Good Lovin'"and "The Stranger (Two Souls in Communion)," there inclusion (and, in some small part, the raison d'etre for this show's choice perhaps), a gesture of recognition for one of the Grateful Dead's founding members whose physical frailty would manifest itself on the forthcoming jaunt across the Atlantic and prove his demise in the not to distant future. Those aforementioned numbers featuring one of the group's found members also make musical sense, elevating the good-natured whimsy in the Dead persona (and oftentimes here outright comical exchanges with each other and the audience), as foils for the more reflective likes of "Deal" and "Looks Like Rain." The r&b roots are also light years from the deep space explorations of "Playin' in the Band" and, even to a greater degree as interwoven with "Drums" and "The Other One" slightly later in the show. Jesse Jarnow's arch liner essay makes a point about the paucity of dance music in the Big Apple around this time, but he needn't protest so much: the facts he presents speak for themselves in terms of the frequency and continued success, artistically and commercially, of Grateful Dead appearances in New York City. Certainly this example of wizened hindsight, recorded by Rex Jackson, curated by David Lemieux and mastered as usual by Jeffrey Norman, captures the group hitting their stride in an alignment formulated the autumn before, through the enlistment of pianist Keith Godchaux and vocalist Donna Godchaux. With drummer Bill Kreutzmann the sole percussionist, the so-called 'cowboy songs' such as "El Paso" fulfilled their function as touch-points of economy as well as respites from more open-ended exploration;the sextet maintains the balance with a palpable sense of adventure, aware of its precarious nature, but nevertheless especially gleeful traversing of the tightrope on this early spring night in New York. Of course, over the course of three decades following this show, the Grateful Dead walked their particular walk in all manner of gaits before they were through. It's only one measure of their distinction in the history of rock and roll that they reinvented the concept of "definitive" as a relative state and, as this concert declaims, were wholly at ease doing so, even at the cusp of a major career transition. Track Listing: CD 1: Greatest Story Ever Told; Cold Rain and Snow; Chinatown Shuffle; Black-Throated Wind; You Win Again; Mr. Charlie; Jack Straw; Loser; Looks Like Rain; Big Railroad Blues; Big Boss Man: Playing in the Band; El Paso. CD 2: 1. Good Lovin'; Truckin'>Drums>The Other One>Me And My Uncle>The Other One>. 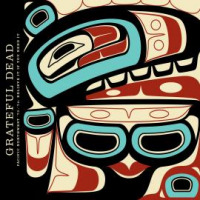 CD 3: Wharf Rat; Sugar Magnolia; The Stranger (Two Souls in Communion); Not Fade Away; Goin' Down The Road Feeling Bad>Not Fade Away. 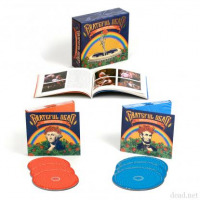 Personnel: Jerry Garcia: guitar, vocals, pedal steel; Keith Godchaux: piano; Bill Kreutzmann: drums; Phil Lesh: electric bass, vocals; Ron "Pigpen" McKernan: organ, harmonica, percussion, vocals; Bob Weir: guitar, vocals.